Why is he here? Dragged a team to the World Cup Final in 1994, loved by the fans of everyone he played for and rowed with enough coaches to actually deserve the disgracefully over-used tag of ‘mercurial genius’. The Devine Ponytail: Everybody’s favourite Buddhist, Roberto Baggio was the kind of intelligent footballer that made the Italian league so addictive a decade ago. The classic deep-lying forward he has been both worshipped and vilified in an amazing career. Starting out with his hometown club Vicenza in Serie C when he was 17, he scored six goals in his first season and 12 in 29 games during his second. From there he moved to Fiorentina in 1986, with the Serie A outfit still in the lower echelons of the league. It was a season blighted by injuries but one which ended on a good note when he scored his first of 205 Serie A goals (that total makes him number five in the all time top scorers in Italy’s top division) against Diego Maradona’s Napoli on 10 May 1987. The next season was when everything started to happen for Baggio; a call up to the national side was followed with an impressive strike rate and a European spot for the Viola. 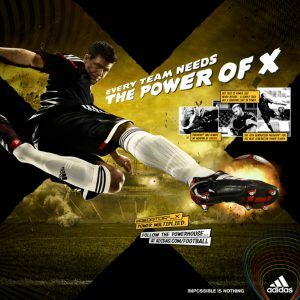 The next year he bagged 17 goals in the league and led the team to runners up medals in the Uefa Cup. However, the team they lost to in the final – Juventus – had seen enough to bring the Divine Ponytail as he had become known to Turin for a record fee of €13 million or 25 billion Italian Lira. He was a substitute for the national team as they hosted the 1990 World Cup, though he came off the bench to score a wonder goal against Czechoslovakia in the final game of the group stages. Italy would finish a deeply disappointing third in the tournament and the awful Fifa-staged official photos of the team holding bouquets of flowers and bronze medals at the end still make for embarrassing, painful viewing. Baggio would soon become the playmaker in a fantastic Juve side. The Old Lady went close to knocking Milan off their perch several times before finally landing the league in 1995 but it was during this struggle that Baggio claimed personal glory. He won the European and World Footballer of the Year awards in 1993 and video montages of his free kicks, back-heels, and absolutely astonishing dribbles were played everywhere. The BBC even had one of him with music provided by ‘The Key, The Secret’ by Urban Cookie Collective. Now there’s the type of odd knowledge and sad obsession with football that befits the men who set up this website. Moving swiftly on…. Before Juve claimed the title in ’95 Baggio also had his ultimate high and painful low at USA 94. In the space of four weeks he went from losing to Ireland then being substituted against Norway (when Italian keeper Gianluca Pagliuca was sent off) to inspiring a thoroughly average side to the final. In the second round his last minute equaliser against Nigeria saved them from elimination and he would score the winner in injury time. Then against Spain in the quarterfinals, he turns up with three minutes to go bursting through the defence, riding a tackle, rounding the keeper and slotting the winning goal home. Just for good measure he scored the two goals that landed the Italians in the final, as they beat Bulgaria in the semis; one of which was a peach as he beat two defenders and passed the ball into the bottom right-hand corner from just outside the 18-yard box. Then came the downer – he injured his thigh against Bulgaria and was told by doctors not to play in the final though neither he nor the manager Arrigo Sacchi listened to medical advice and decided he would play at barely 50% fitness. Unfortunately, they would play out the worst World Cup final in living memory against Brazil. Inevitably, it went to penalties and after Franco Baresi and Milan’s Daniele Massaro had already missed Baggio skied his kick into the Los Angeles crowd. Al Gore presented Dunga with the trophy and the Italians went home disgusted and defeated once more. Even though the following year brought the title, Baggio’s time at Juve was being disrupted by the emergence of Alessandro Del Piero. At the end of the season, he moved to AC Milan where he would win a second title despite only scoring seven goals in 29 games that year. The next three seasons brought spells with Bologna for one year and Inter Milan for two. The former was a superb success (he scored 22 goals); the latter wasn’t. After a first year of injuries he fell out with incoming manager Marcelo Lippi and left. 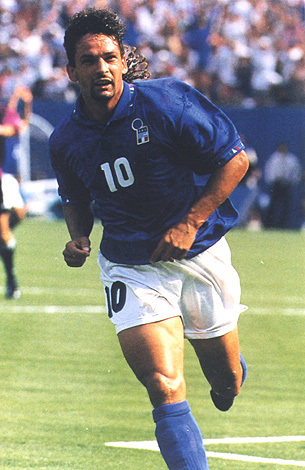 It should be remembered that Baggio was never popular with much of the Italian public. This falling out with Lippi at Inter was just the latest in a long line after a rift with Capello at AC Milan and disagreements with successive national managers. Also, some commentators often cited his religious beliefs as a hindrance when it came to popular support in a predominantly Catholic nation. Whatever, the legend of Baggio was cemented by two moves of courage for a footballer. The first was stepping up to take a last-minute penalty for Italy in the first game of the 1998 World Cup against Chile – scoring to make it 2-2 and exorcising the ghosts of ‘94. The second, moving to Brescia in September 2000, an unfashionable side who had only just been promoted. For four years he kept the side up, scoring plenty and setting up even more. When he got his 200th Serie A goal at Parma, the home fans gave him a standing ovation. When he played his final game, captaining a Brescia side against AC Milan, he left the field late in the second half to yet another standing ovation from players, fans, staff and most likely those watching on TV across the country as well. Not easy to like for some, but quite simply one of the best players in the last 20 years. Bobby Baggio, a pure legend.